Pocket door kit for use within timber stud walls. Includes all track, hangers, guides and fixings. Internal Pocket (Cavity) doors that disappear into the wall. Timber header incorporating anodised top track, nylon treaded wheels with sealed ball bearings, corrogated steel covered studs and nylon bottom guides. 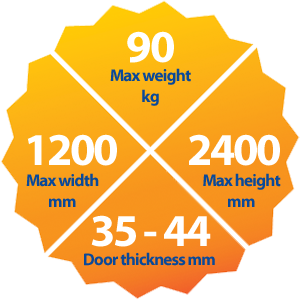 PD1 for doors 608mm - 915mm wide and 2032mm high. A jointing kit is also available for creating a double door bi-parting layout.